To celebrate 10 years of software innovation, now Uniblue MaxiDisk available for free. Everyone can get Uniblue MaxiDisk Serial license key for free. Earn 100% discount or download this tool at free of charge. Also get benefit to upgrade to Uniblue Powersuite Pro with 70% discount. Uniblue MaxiDisk is a product that designed to optimize a computer’s hard disk. It detect unnecessary files on a hard disk and delete the files safely. It provide easy way to remove Windows temporary files, internet history, and other unnecessary files. The serial number or license key is included with the installer. Just download the installer from following links. It a short time giveaway and will ends soon. Download Uniblue MaxiDisk: click here to download now! Also, get benefit to buy upgrade license key for PowerSuite Pro. Buy upgrade license key for PowerSuite Pro with 70% discount. The vendor says, this free offer is available until May 2016. After the offer expires, you can buy the software. Buy Serial Number for Uniblue MaxiDisk: Click here to Buy! There no discount on the regular offer. Normal price the serial number or license key is $29.95. Analyze your disk and increase the hard drive performance. Clean out all unnecessary files just in a few easy clicks then free up some hard disk’s space. Compress large file to gain storage space. Easily manage settings and access essential system information. 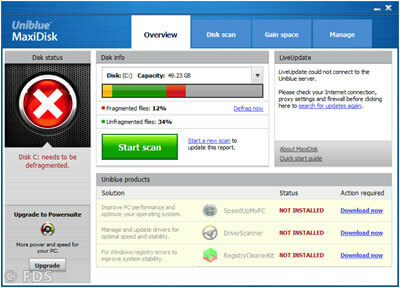 Uniblue MaxiDisk is the compact solution for hard disk maintenance. It offer complete tools to clean, remove old backup, compress files, and defrag hard disk.